I’ve been doing a music residency with a grade 1 and 3 class at Grandview Elementary in Red Deer for the past week. I’ve seen the children every day for 35-45 minutes, and have had an amazing time with them! 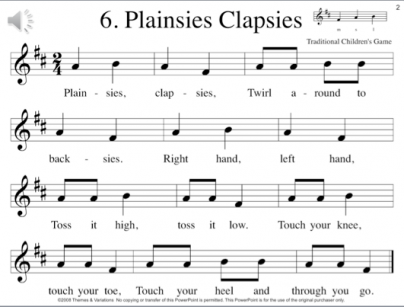 One of the lessons that went really well was a lesson on ostinato using the singing game, Musicplay 3, #6 Plainsies Clapsies. I taught the song by rote. This is a traditional ball bouncing game, but to make it a little more useable in the grade 3 classroom, we did the moves with beanbags. We played the game the way Leise Warner from Ontario showed me. The students were excited to try out the moves themselves! The first day there were just a few students who were able to do all the moves, but by the second day, most were successful. 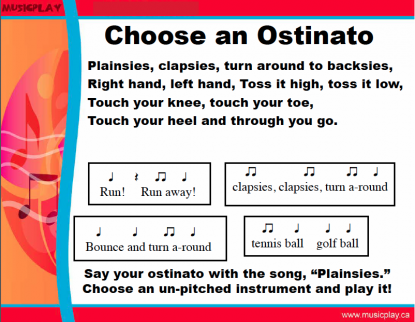 On the second day, we tried several of the ostinato patterns on the slide, chose one of them, and decided on body percussion. We discussed what the form of their composition was. Ostinato 2x – ostinato+song – Ostinato 2x I used the form tool at www.musicplayonline.com (on the left hand menu) to illustrate the form. In the next few lessons they perfected the game, and used the song to practice reading and writing and creating with la-so-mi and ta ti-ti. This is one of the lessons that I’ll be sharing at the Artie and Denise workshop in Chicago! Artie and Denise are Shakin it up in Chicago! Join Artie and Denise for the 7th annual summer symposium! Two days of fabulous workshops and a day of sightseeing. This amazing site is free to use until August 1st, and will be a low cost subscription after that. Our programmer now has the games fully accessible by iPhone or iPad! The entire site can now be utilized by devices. We are currently working on the Listening section, and will have some wonderful listening movies posted next week, including Carnival of the Animals! 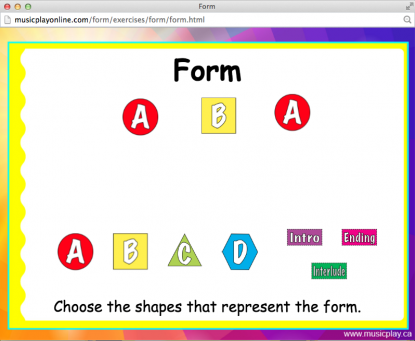 * Interactive Form Tool is now online – left hand menu! * Recorder Resource 1-2 are available on the site! * The Easy Ukulele unit and Easy Guitar Songs are online! * Beat and Rhythm interactive activities for Snail Snail, Follow Me, Cuckoo, Rain Rain, See Saw, Walk to School, Pumpkin Fat, Teddy Bear, Curly Joe, Old Mother Brown, Little Airplane, Kangaroo, Tisket a Tasket, Burnie Bee, Four in a Boat, Bubble Gum, Easter Bunny, Old Mr Rabbit, on a Log, Scie le Bois, Los Pollitos, Naughty Kitty Cat, The Mill. These are amazing interactive tools! * Ask Me take home printables for songs in Musicplay for Kindergarten. * pop quizzes to practice note names, dynamics terms/symbols, tempo terms, Fun! This entry was posted in Lesson Plans, Ostinato, Uncategorized and tagged ball bouncing games, Denise Gagne, music lesson plan, music lesson plans, ostinato, ostinato lesson plan, Plainsies Clapsies, singing games on May 8, 2016 by Denise Gagne.